The better our relationships are at work, the happier and more productive we are going to be. If you have ever experienced a difficult coworker then you understand the impact of stress and anxiety it can have on not only your work life but also your personal life. If you are starting a new job or have worked in the same business for 10 years, a simple strategy of trust and mutual respect will go along way when developing working relationships. Hard work, honesty and a positive professional attitude are traits that will develop your career alongside the positive relationships you build along the way. Unfortunately, there will always be some level of office politics and gossip and it can negatively impact on team cohesion, morale and productivity. Don’t risk joining in on gossip and spoiling your reputation, how would you feel if you were the person at the centre of the gossip? Also be sure to show your enthusiasm for the business and where it is going. If you are in a meeting, share your thoughts, show you want to be there. People are drawn to positive people and if you show yourself to be that person, good working relationships will form out of respect. This doesn’t mean doing their work for them! Share your knowledge, experience and ideas. Show you aren’t a competitor but part of the team. These small offerings of help will demonstrate you are trustworthy and reliable which in turn will gain your coworkers respect. Wouldn’t it be lovely if when you are walking the corridors of your workplace you can smile and say hello to everyone you see? Stretch your social self across the business. Small talk with the receptionist on your way into the office or sitting with someone who may not be in your team at lunch. It is easy to fall into the trap of only socialising with those who are in your team or department, although these relationships will be strong, you also don’t want to be classed as being part of a clique. 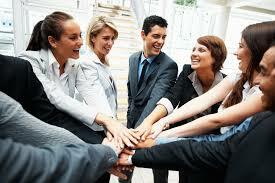 Showing yourself as having developed relationships with coworkers across the business is the way forward. Nobody relies on or respects someone who doesn’t meet deadlines or follow up on promises. If you become this person you risk your reputation and damage potential working relationships. Open communication is imperative, if someone expects something done by you on a deadline, keep them updated. If its going to take longer, tell them. Communicating openly leads to a closer working relationship.